So, we have been tracking the iPhone features for quite some time now.We also reported how Mr.Steve Jobs acknowledged the apps crash on the iPhone.Let's now focus our attention to some extra gadgets which can be used on the iPhone. Have your ever wondered if you could use your multi-utility iPhone even as a telescope?If not, then we'll tell you - "YOU CAN". 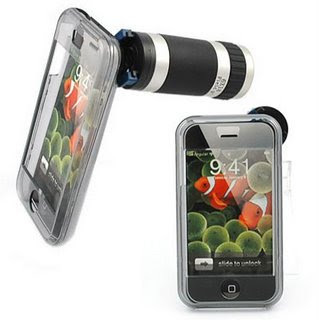 One of the most critical feature of the iPhone is its 2 mega pixel camera.You might have wished that Apple could have done a lot better in the camera.But wait, did you know that you can.This add-on telescope for the Apple iPhone won’t make your mobile phone look very good, but it will give you 6x zoom capabilities. Change the cellphone back shell first enclosed with the telescope. Adjust the clear foucs with the naked eye. It can take a picture while fixing the telescope on back shell. (If the screen of your cellphone is analyzed degree enough, you can adjust the focus with the screen of the cellphone). The Apple iPhone Mobile Phone Telescope ($19) is available from Brando.